Take ultimate control of your space with Samsung Connect Home Smart WiFi System, a WiFi router and a SmartThings hub, all in one. Not only does it deliver an optimized WiFi signal to every corner of your home, it also works as a SmartThings Hub, connecting compatible cameras, lights, voice assistants, and more to create your smart home. Plus, you’ll never have to worry about updating firmware—Samsung Connect Home will update automatically. 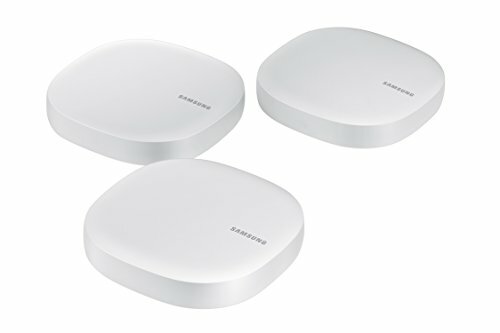 Unlike traditional routers that can cause dead zones and buffering, Samsung Connect Home Smart Wi-Fi System uses three units working seamlessly to create a mesh network that can cover homes up to 4,500 sq. ft. keep hundreds of your devices connected at the same time and control them from anywhere in your home using the user-friendly Connect App. Built-in Ethernet ports and powerful tri-band mesh make this system the perfect solution for work-from-home professionals, entertainment systems, and homes with Ethernet wiring.